Whilst I will knit in the car, on a campsite and in hospital, I’m not really one for group knitting or knitting on the tube and I’ve never been to a workshop or had any formal instruction. I currently have the time and so signed up for a workshop day run by Debbie Abrahams through Rowan at John Lewis. Debbie is such a lovely girl and we certainly had a fun day. Nobody else was taking photos, so I felt really self-conscious about it, so sorry folks, I didn’t. I should really have taken one of the kit before it got hacked open because it looked so lovely. Apparently her Mum makes them up for her. 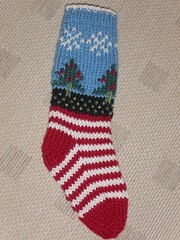 The project was to knit up a mini Christmas stocking using the techniques of fairisle, intarsia, slipstitch beading, swiss darning and mattress stitch. She also covered wrapping stitches and weaving in ends. We covered a massive amount in one day and she seemed to be quite impressed with how much we all covered. I think we were all fairly proficient knitters to start with though but it was a fun day and here’s the result! Her new book will be released in the UK in a week or so but you can buy it on Amazon. Having a good old fashioned tidy up!